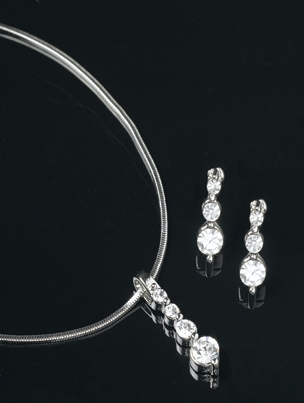 If you like a subtle sparkle, then this rhinestone jewelry set is for you. Like dewdrops swell before falling from the leaf, the rhinestones in these earrings start small and gradually grow in size as they dangle from the ear. The silver-toned snake style chain boasts a triple teardrop pendant to match the earrings. FWO Extras: The 16" pendant necklace comes with a length extender.The earrings are pierced.